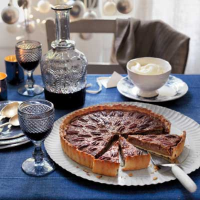 This delicious tart is great for entertaining - it's just as good with a cup of tea or coffee as it is as a dessert. 1. Roll the pastry out and use to line a 23cm tart tin. Then line the pastry with baking parchment and fill with baking beans or uncooked rice then chill in the fridge for 20 minutes. 2. Preheat the oven to 190ºC, gas mark 5. Bake the pastry for 20-25 minutes, then remove from the oven and take out the baking beans and parchment. If the case still feels a little wet you can return it to the oven for another 5-10 minutes without the parchment. Allow to cool on a wire rack. 3. Briefly whizz two-thirds of the pecans in a food processor until roughly chopped. 4. Reduce the oven to 180ºC, gas mark 4. Mix the eggs, golden and maple syrups, vanilla, bourbon, butter, sugar and the chopped pecans together and pour into the pastry case. 5. Arrange the reserved pecans over the top. Bake for 35-40 minutes until set. Allow to cool and serve in wedges, with a dollop of cream and a drizzle of maple syrup, if you wish. This recipe was first published in Wed Oct 02 15:36:00 BST 2013.